A few months ago I went to a friend’s birthday dinner at a hot “Southern” restaurant. The place, whose name I won’t mention, is focused on serving home-style suppers -- an array of dishes with which most Southerners would be at least somewhat familiar, particularly if they’re from under the Bible Belt. My wife and I went in expecting, more than anything else, some good comfort food, and on that, they delivered. But when the check arrived, we were surprised to learn that the cost of two cocktails, two appetizers, two main courses, and a shared dessert broke the $100 barrier. Once I digested the reality of the bill’s total, I was no longer complimenting the decor, the perfect plateware and silver, or the amazing service. All I could think about was how less-soulful I felt. It seemed like I was supporting the overhyping of something that’s supposed to be, by its very nature, void of hype. When did soul food go so Hollywood? And before you even start to wonder, this isn’t another swipe at hot chicken, my ATL-loving/defending friends. This is much simpler. It’s about Southern “soul” food in general, and how it’s standing in the need of a little soul-searching itself. 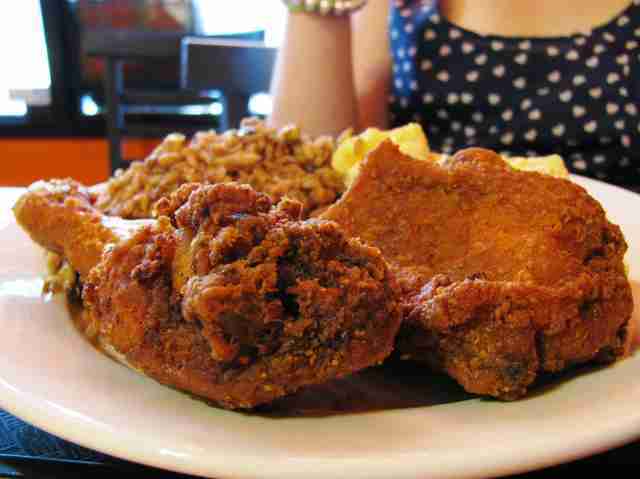 What exactly is soul food? It’s the same reason most people are only offered a selection of bush-league, Westernized dishes when they visit a typical Asian eatery. Which, because Johns Creek is an Atlanta suburb, means that even fake Chinese food from North Fulton is “Southern” if we don’t set realistic parameters here. 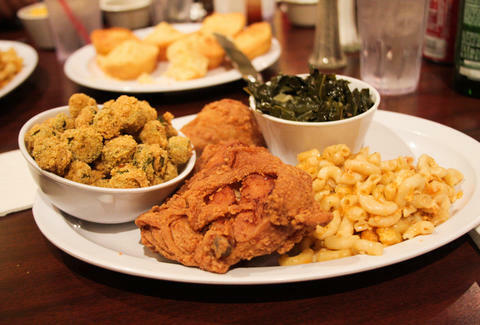 Therefore, let’s meet on the mutually understood ground that “soul food" and “Southern” food are marketed to people who expect the same thing on their plates -- fried chicken, greens, mac and cheese, cornbread. Now let's move on to the next grievance. Soul food has absolutely no business being expensive. Nobody’s saying people don’t appreciate when restaurants incorporate high-quality ingredients in their classic dishes, even if such things like cage-free eggs, free-range organic chicken, or locally farmed blackberry jam require an upcharge in the cost of doing business. 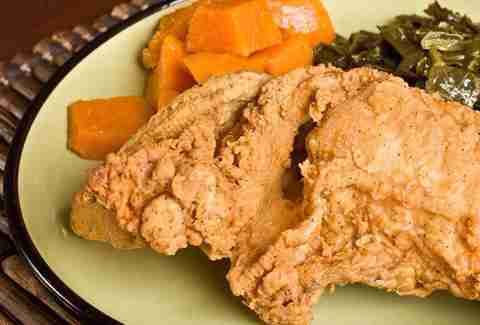 But regardless, you should be able to get a plate, sides, and a couple beers for no more than $25-$30 a person -- max. Anything over that is egregious, and the higher the price tag, the less likely you’ll feel that authentic soul glow that just shines through, much like the sheen on Darryl’s Jheri curl in Coming to America. My strong suspicion is that people will tell you that Chanterelle’s, a “gourmet soul” Atlanta restaurant open since 1987, is one of the best and most reasonably priced restaurants in town, with under-$10 dishes like rosemary chicken that are favored by most of your favorite Atlanta rappers who can afford to spend much more on herbed poultry. The word is out: people will pay to eat like we do in ATL. Have you ever stopped to wonder how costly it is to make fried green tomatoes, cornbread pudding, sausage biscuits with gravy, or dumplings? It doesn't take much. Actually, a lot of those dishes became popular because they were so cheap and so easy to throw together. And realistically, Southern folks are probably not the kind of people that immediately come to mind when you think about people with wealth. Southern people are, however, famous for treating each other like true neighbors, whether descendants of slaves, slave-owners, or just people with thick accents and thin pockets, who simply couldn't afford anywhere else to go. Even those who didn’t intermingle knew how to live off the land by eating what they could grow, and trading crops with folks who had stuff they didn’t. The net effect was that even if you came from a cash-poor family, you always got a farm-to-table dining experience, and the cost was nowhere near what we pay for organic grocery store produce today, even adjusted for inflation. What we see today with soul food’s popularity happened because certain chefs started becoming famous in places nobody would ever expect to visit. Standard-bearers, such as the James Beard Foundation, have the power to turn sous chefs into celebrities, and as a result, a few unlikely Southeastern cities (that probably didn’t think anybody cared) have become premier foodie destinations for people willing to spend money traveling just to taste so-and-so’s sweet potato pie. Patti LaBelle proved that you can make big bucks distributing your version of a Southern supper staple and charge more than something’s really worth if you have a good enough product and exposure. The word is out: people will pay to eat like we do in ATL. Lay’s Southern Biscuits and Gravy potato chips, which won the 2015 “Do Us a Flavor” national competition, are probably the most obvious attempt at turning soul food into a packageable product. Literally. There are also restaurants in New York that sell something called “Southern fusion” cuisine, which apparently means red velvet waffles, “frizzled” onions (? ), and short ribs layered in coconut-molasses ginger sauce (I die). And those are the same restaurants hitting you with checks that add up to more than $100 for a simple dinner for two. Pre-20% tip. For soul food. Here’s how deep the pockets actually go: a couple years ago, thanks to a hookup from my homegirl, I was able to attend something called the Southern Food-Writers Conference in Knoxville. And it was amazing. I had the opportunity to meet and eat with prominent Southern food personalities like famous culinary Charlestonians Nathalie Dupree and Carrie Morey (owner of Callie’s Hot Little Biscuit, which just opened in Virginia-Highland), along with James Beard winners Adrian Miller (author of Soul Food: The Surprising Story of an American Cuisine, One Plate at a Time) and Chef John Currence of Oxford, Mississippi. Restaurants in New York sell something called “Southern fusion” cuisine, which apparently means red velvet waffles, “frizzled” onions, and short ribs layered in coconut-molasses ginger sauce. We had dinner at the illustrious Blackberry Farm, a luxury farm-to-table resort which costs at least $1,000 to stay overnight, and is $125-per-person for a meal (although this one came with our conference admission). There, eating a dinner that included truffles and foie gras (which I don't even like), I couldn't help but think, “Is this the new standard of southern food? Why is this place so damn expensive?”, and “Isn’t this place owned by the family that started Ruby Tuesday?” No disrespect, but I worked at an Atlanta-area Ruby Tuesday many years ago. Those folks know how to save a dollar, but maybe not a whole lot about soul food. Tracy, 52 years old, inherited Busy Bee Cafe from her father Milton, who bought it from the original proprietor, Lucy Jackson, in 1982. It has been open since 1947, and she’s worked there for 20 years, from the bottom up. 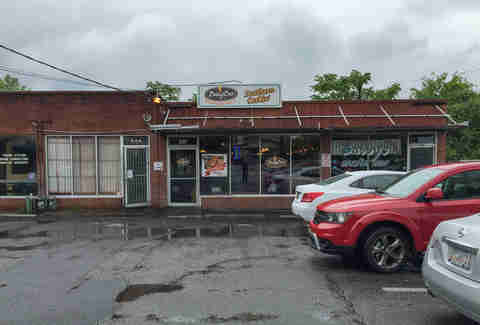 And although it is strangely not name-dropped in Goodie Mob’s infamous “Soul Food” song, Busy Bee Cafe is widely regarded as one of Atlanta’s most historic, respected, authentic and delicious soul food institutions. 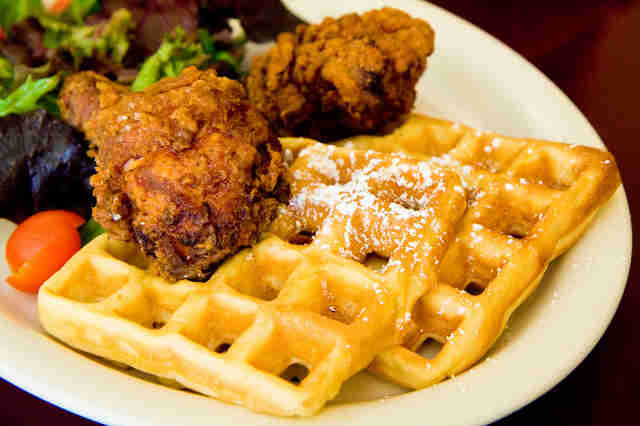 "Soul food is part of America’s cultural landscape, like the blues." If a guy is willing to spend whatever it takes just so that a room full of people he’s never met, and never will, can enjoy the same comfort and happiness he wants to have before his life ends, you’re safe calling that a soulful experience. It wasn’t about the money; it was about the feeling. And sure, Busy Bee made money that night, and will continue making money now that it’s been popularized once again by the coverage it received after serving one of today’s biggest rap artists and a popular Democratic presidential candidate. But it’s probably safe to assume Tracy isn’t going to raise her prices just to impress anybody that wants to fill up on a hot plate of Southern hospitality. Unlike the Frito-Lay company, or that unnamed restaurant with the two-for-a-Benjamin dinner special, she’s happy to give hungry folks what they want, because that’s what keeps them coming back. At the end of the day, it's a simple algorithm: make something people love. Mike Jordan eats soul food, has seen the movie Soul Food, and knows all the lyrics to Goodie Mob’s first album. You can’t out-soul-food him, but try your luck by tweeting @michaelbjordan.